The new Tennant T2 walk behind scrubber adds a whole new dimension to Tennant’s high quality scrubber line up. Up till now purchasing a compact scrubber of any brand meant sacrificing quality and durability. The truth is that most machines of this size just don’t hold up when used daily in commercial application. The T2 is the exception! The Tennant T2 is built of similar design and materials used in Tennant's larger equipment. The cast aluminum scrub deck and squeegee will never rust. Quick change brushes and squeegees make it a breeze to maintain. The high quality wiring and electrical connections along with industrial quality motors will make it last for years. Tennant backs up this claim with a 3 year parts and labor warranty. The tanks have an 8 year warranty! 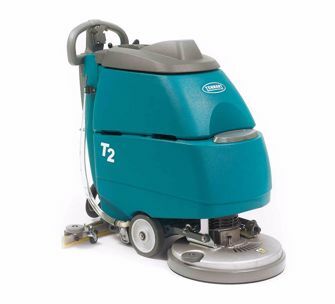 Cleaning professionals choose the T2 because of its extremely attractive price coupled with outstanding productivity. Scrubbing with it is at least 10 times faster than mopping. Productivity is also increased because the T2 can go almost anywhere allowing it to clean tight congested areas. Using a mop and bucket along with your automatic scrubber might be a thing of the past if you purchase one of these highly maneuverable units. The Tennant T2 can be leased for about $4/day.